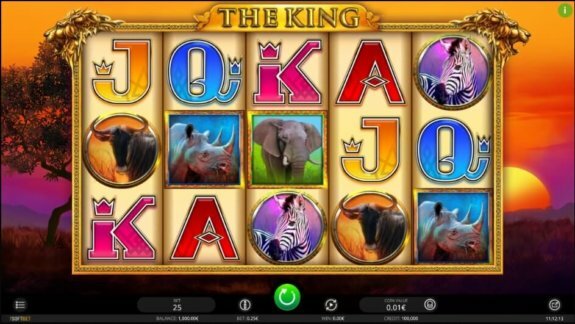 The King is a terrific slot game by iSoftBet that will take you on a safari through the savannas of Africa. His Majesty, the Lion, invites you to join the pride and win great prizes over the 5*3 grid with 25 paylines guaranteeing outstanding payouts and fun. Let the jackpot worth five hundred times your stake speak for itself. Why The King? Join this adventurous safari through the savanna and enjoy every moment of it. Become the King, just like the Lion, with it's great features and bonus rounds. Where to play The King? The life in the savannah is tough, and only the fierce can survive. 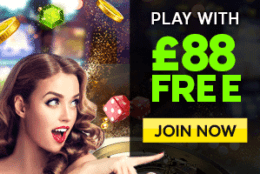 Embark on this journey with the King himself and prove you are ready for the large prizes, secured by the grandiose 96,01% RTP over the 25 paylines on the 5×3 layout. 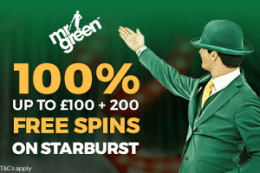 Free Spins and Cash Wheel bonuses offer the chance of winning great payouts that go even up to 100,000 coins. That’s something to keep you up at night, isn’t it? Buckle up and get ready for a hell of a ride through exciting plains of Africa. Even though they haven’t been around for a long time, iSoftBet are starting to make a name for themselves with games such as The King. Their games are rich in graphics, animation and abundant in winnings. The King can be easily found in most online casinos and if you are not sure whether to give it a try, take a look at what our experts have to say about it having tested all of its features. The King’s main character is a lion, whose roar echoes throughout savanna. The backdrop of Africa’s sunset adds to the whole image of the mystic and enchanting graphics of the game, featuring all the significant animals from the King’s realm – a zebra, an elephant, a rhino and a buffalo – all set to give you great winnings. 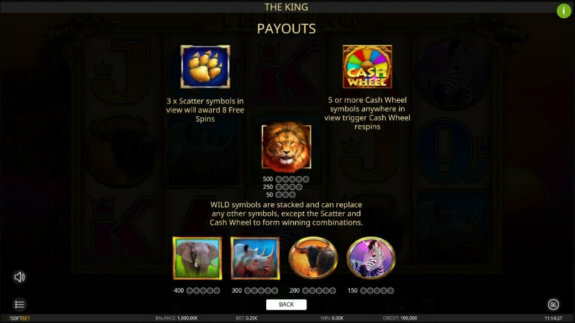 Joining this safari will prove why ‘The King’ is a one-of-a-kind slot game. As is the case with most iSoftBet games, the interface is entirely user-oriented and serves to your complete enjoyment. Before setting the reels in motion, the player is required to choose the amount he or she wishes to bet, ranging from 0.01 – 1 € per 25 constantly active lines. 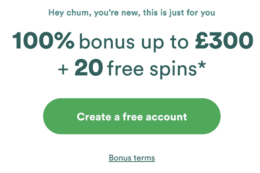 The autoplay option allows the player to set the number of spins the machine will set in motion, as well as to set the loss limit which can come in handy. Game’s 96.01 RTP ensures your time spent playing will be worth your while. Play The King for free! The game hosts the standard card symbols as symbols of lower value and symbols of higher value represented through the images of a zebra, an elephant, a rhino and a buffalo. The winning combinations require at least three identical symbols to appear on the active lines starting from the first reel on the left. The game’s bread and butter are the different combinations of three special symbols. Wild – The stacked symbol is in the form of an image of a roaring lion showing all its might which can replace any other symbol to form the winning combinations. Scatter – The scatter symbol is a lion’s paw that awards the players with 8 Free Spins if three or more of them appear across the reels. 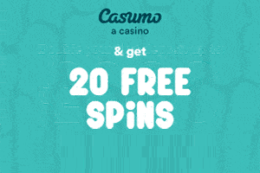 Bonus – The bonus game features a fortune wheel which appears in vertical stacks where 5 or more of them are needed to trigger Cash Wheel bonus spins with huge prizes. The winning features of the game are manifested in different forms with the most lucrative one being the Cash Wheel. 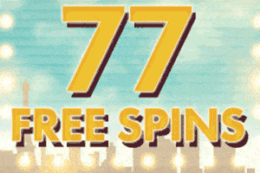 When a player scores five or more fortune wheel symbols, the above mentioned Cash Wheel bonus game emerges and allows the player free respins that continue until no more fortune wheels appear. 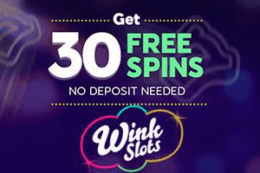 The total number of symbols is then calculated, and depending on the number of fortune wheels, the player will get a chance to win humongous prizes through three different Cash Wheels; Super Cash Wheel, Mega Cash Wheel and Epic Cash Wheel where a player can win up to 100,000 coins! 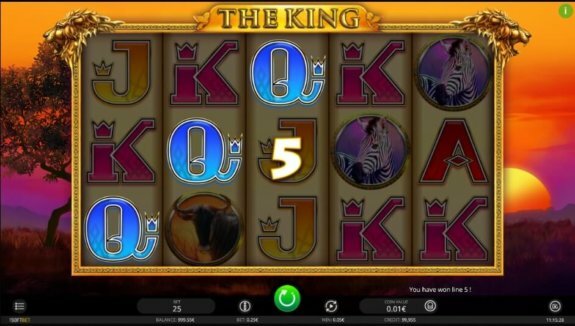 If you are in the market for a high-paying and fascinating slot game with a superb theme – The King is just what you need. 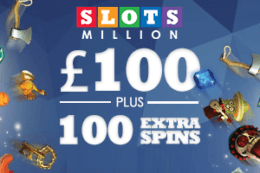 We highly recommend you get to know the excitement of playing it for real money and you will never feel the same about slots again, guaranteed! As a unique game with stunning awards and vivid animations, The King is winning the hearts of most players out there, and if you’ve decided to give this exceptional slot a go, we recommend playing it at some of the best online casinos around, such as 888Casino, RIzk Casino or Sloty.